"Why is that sad look in your eyes"
- from Tell Me Where It Hurts by M.Y.M.P. Die Deeper Into Life is the 6th in a series of "Modern Poets" by Penguin Random House U.K. Each book consists of excerpts of the work of 3 renowned Poets writing in the 21st century. 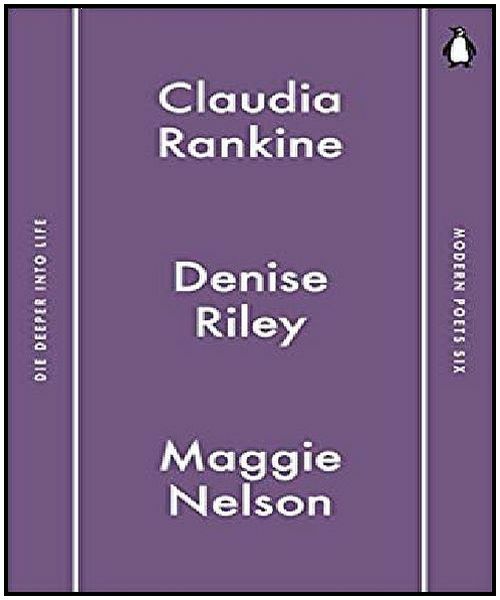 This book of poetry features work by Claudia Rankine, Denise Riley and Maggie Nelson. The title is telling, Die Deeper Into Life, gives an oeuvre into the suffering wound, dwelling inside the darkness of the overconstructed postmodern Western world with the broken social scene, broken love lives and cult of ego culture, each of these outstanding women Poets brings a sense of themselves, their soul rhythms and experience inside the writer's craft to their work. All 3 Western women Poets write largely in poetic narrative, are considered and publicly acclaimed, bridging the Industrial Age era into the New Economy. Claudia Rankine is a Chancellor of the Academy of American Poets, teaches at Yale University and has received many awards and honours including fellowships with the Guggenheim Foundation, and the National Endowment of the Arts. She has written 5 books of poetry, including Nothing in Nature is Private (1994), The End of the Alphabet (1998), Plot (2001), Don't Let Me Be Lonely: An American Lyric (2004) and Citizen: An American Lyric (2014), 2 plays, including Provenance of Beauty: A South Bronx Travelogue (2009), contributed to several video collaborations and is the poetry editor of several poetry anthologies. A shadowed Victorian day hospital, this poetry rolls out in poetic narrative with Imagist influences spins into day mares and Surrealist spaces. This poetry begins somewhere firmly rooted in reality, creates as if the Poet were in public spaces, with her thoughts spinning into spaces of fear. Dealing with themes of racism and death, the poetry brushes with the underlying American horror movie esplanade, zombies, vampires, monsters, witches with the occasional angel, a subtle violence becoming louder. The illumination that it didn't matter if you were gifted, if you were stupid, if you were blonde or non-blonde, if you had no redeeming features everyone was systemically ruined by someone through broken love bonds that translates as emotioinal violence and perhaps actual violence. This poetry is a magic awakening of the Spirit into the dark spaces of the lonely disembodied universe, the constant watch for violence and how it destroys the peace of angels. A brilliant and considered read. Denise Riley is a renowned Poet and philosopher. She is a professor at UEA in London and has held teaching positions at universities in the United States, the U.K. and Europe. She has written many philosophical works on feminism, early childhood, language and several books of poetry, Including Marxism for Infants (1977), Dry Air (1985), Mop Mop Georgette (1993), Penguin Modern Poets 10 (1996), Selected Poems (2000) and Say Something Back (2016). New Age Renaissance poetic works that bang and recede in poetic narrative with Confessional and Beat poetry influences. This poetry breathes in original use of language and images, rooted in colours and the natural world while presenting a high degree of personal introspection. Themes of loneliness, violence, death, loss (of a son, possibly a lover(s)) dialogues as if the Poet is a witness creating a journal of days. Some of the endings of poems are bit offerings as if the thoughts are Escher black ink drawings, hallways and stairs that are blocked. I roam around around around around acidic yellows, globe . . . "
As if she is painting a picture interspersed with a longing for a lover, the poem becomes a fantastical poem of want. A beautiful montage of wordscapes, a commentary on the emotional and actual violence of life in the West. Maggie Nelson (Poet, literary critic and non-fiction writer) lives and works in Los Angeles and won a MacArthur 'Genius' Fellowship in 2016 and other awards. She has written: Jane: A Murder (2005), The Red Parts: Autobiography of a Trial (2007), Women, the New York School, and Other True Abstractions (2007), Bluets (2009), The Art of Cruelty: A Reckoning (2011), The Argonauts (2015) as well as the poetry collections Shiner (2001), The Latest Winter (2003) and Something Bright, Then Holes (2007). any foundation either. It leaves everything as it is." The dark hallways and passages of the furniture factory. The Argonauts a first-person narrative about being the wife of a transgendered person is a very eloquent story of love. Full of rich literary coins, fantastical imagery and original juxtapositions of words, these Poets are an exciting example of the craft of Poetry inside progressions from the Confessional, Beat, and Imagist schools into the postmodernist age. Excerpts from the 21st century House of New Age poetry greats, Die Deeper Into Life from Penguin Random House U.K.
* A movie by David Lynch.